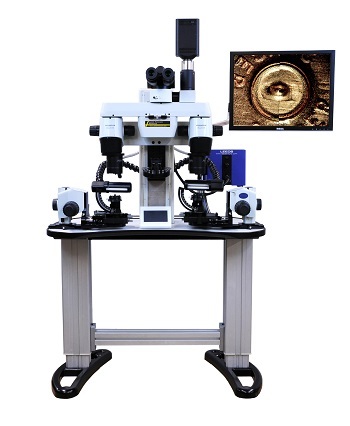 Leeds LCF3 firearms and tool marks comparison microscope built with Olympus optics. 1. Zoom based magnification system with primary magnification range of 6X – 102X. 2. Zoom range of the microscope has 14 matched individual stops where the full system magnification is matched with less than 2% variance. 3. Certificate of Magnification Matching, provided by Leeds’ ISO17025 accredited calibration facility, which is traceable to a NIST (National Institute of Standards and Technology) standard. 4. Par-focal and par-centric fields of view at all magnifications, such that image features being compared remain aligned and in focus from lowest to highest magnification. magnifications without introducing empty magnification. 6. Plan Apochromat Objectives for superior images, with a continuous working distance of 60mm at all magnifications. 7. Built in aperture diaphragm applicable to all magnifications that provides in increase in image contrast and depth of field. 8. Erect and un-reversed images with a 22mm field of view. 9. The ability to compare sample images from 100% right to 100% left, having a divide of any width, or superimposed in any percentage. All adjustments to the dividing line may be done with a single hand control. 10. Universal sample holder that, without additional components, will hold samples as small as 0.030” wire or as large as a 12 gauge shotgun shell. 11. A third eyepiece holder and accessory tray on the column to hold accessories for easy storage and access when not in use. 12. Sample stage with a digital scale and a crosshair eyepiece to allow sample measurements to be taken directly through stage movements. This digital scale comes with an ISO 17025 accredited Certificate of Accuracy that in NIST traceable. 13. Proper ergonomics for the examiner provided by: a stable, height-adjustable; motorized bridge column and tilting binocular, stage movement and sample focus motions that are designed to minimize “over the wrist” motions, and microscope table top that includes a cut out front shape to accommodate various size users. 14. Two fluorescent illuminators mounted on adjustable articulated arms for securing desired position that include rotatable hoods to provide easy lighting control for contrast adjustment.